ÉRIC BEAUDRY was first exposed to traditional Quebec music in Saint-Côme, a village in Quebec’s Lanaudière region. Raised by a family entrenched in music, he began singing and playing guitar at the age of 10. In 1992, he unleashed his musical ambitions on local audiences by founding La Galvaude, followed-up later by Ni Sarpe Ni Branche and Norouet. Éric’s passion for music also helped foster an interest in song, which led to several awards including a 2002 Prix Mnémo for his role in producing the album Musique gaspésienne, featuring violinist Édouard Richard. In 2003, hot on the heels of this success, Éric became a member of La Bottine Souriante. Éric’s love of music also spurred a passion for enlightening others and, following the completion of a Bachelor of Arts in pop guitar and jazz, Éric began teaching traditional music at Joliette’s CEGEP régional de Lanaudière in 2002. 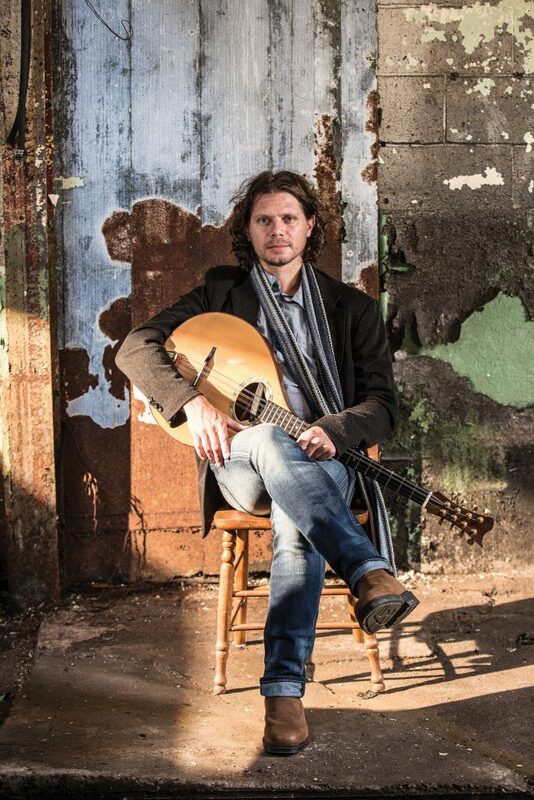 Wherever he performs, Éric’s rich vocal range and unquestionable talent on stringed instruments—guitar, mandolin and bouzouki—guarantee a rousing performance for all. Born in Saint-Hubert, in Montérégie, DAVID BOULANGER starts to play the violin at eight years old. It is during his teenage years that he finds a passion for Québec traditional music. Always increasing, this passion leads David on the big professional stages at the beginning of his 20s with La Part du Quêteux, a band with which he records two album including one that was rewarded as « Best Album – Traditional » at the Canadian Folk Music Awards. Later, he joins the epic Québec trad big band La Bottine Souriante, the two international projects Maja & David and COEFF 4 and recently, he gathers with his long time friends in De Temps Antan. David is also acknowledged for his music composition that can be heard in « Timber! » from Cirque Alfonse and for the original sound track of « Quand ferme l’Usine », a movie from the director Simon Rodrigue. Being a true passionate about Québec traditional music, and wanting to share his knowledge about it, he caries a unique repertoire that one can hear wherever David goes. 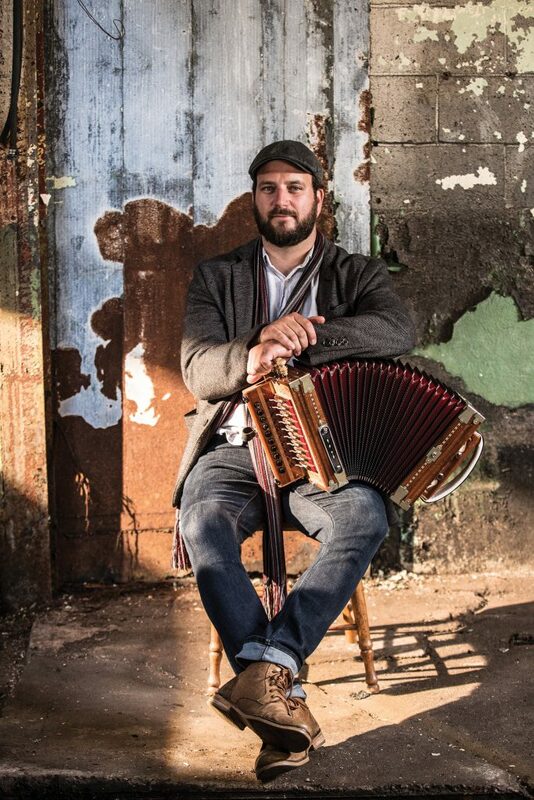 PIERRE-LUC DUPUIS was born in Louiseville, in Quebec’s Mauricie region, and hails from a lineage where traditional music was always at the forefront of daily life. Although he began singing with his family at a very young age, Pierre-Luc was somewhat of a late musical bloomer, taking up the accordion at 18! But what he lacked in experience he made up for in determination. At 19, he founded Les Langues Fourchures, with whom he recorded his first album in 2001. For the next 4 years, he helped the band pay its dues and make its mark throughout Quebec and, in 2003, he joined La Bottine Souriante, one of the province’s best-known music groups. Since then, he’s wowed audiences from Dublin to Porto and Budapest to Melbourne with his unique humour and warmhearted charisma. Since ending his journey with La Bottine Souriante in 2008, Pierre-Luc has devoted himself to his true love—De Temps Antan.